Last weekend, my family and I went to Flushing, NY., one of the largest Korea towns in the U.S., to watch the World Cup Round of 16 game between Korea and Uruguay. Korea played amazingly but still lost! After the game, we ate at a small Korean restaurant nearby. 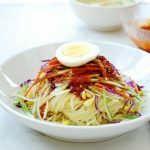 While looking at the menu, bibim guksu got my attention right away. I really did not have to think twice about it, and it was the right decision. The dish was so cool and refreshing! It was just what I needed after the heartbreaking game on a scorching day. 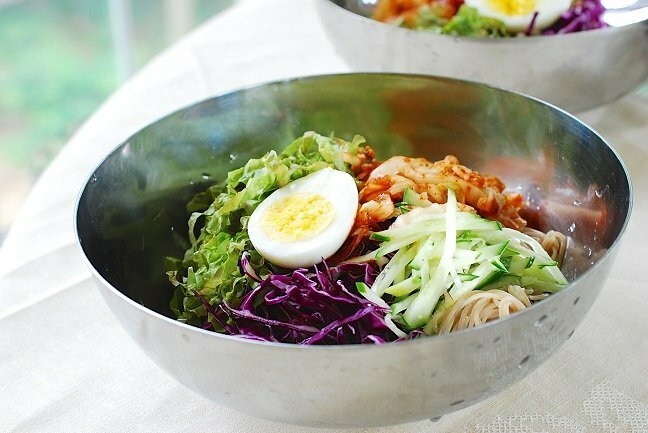 Bibim guksu is a cold noodle dish that is usually made with thin wheat flour noodles (somyeon) or buckwheat noodles (memil guksu). The noodles are typically mixed in a sweet and sour gochujang sauce. 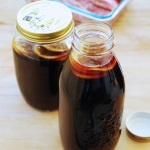 If more soy sauce and less chili pepper paste is used, it can be made mild. You can toss it all together before serving, or arrange everything in a serving bowl so it can be mixed at the table. The latter allows each person to adjust the amount of sauce to his or her liking. 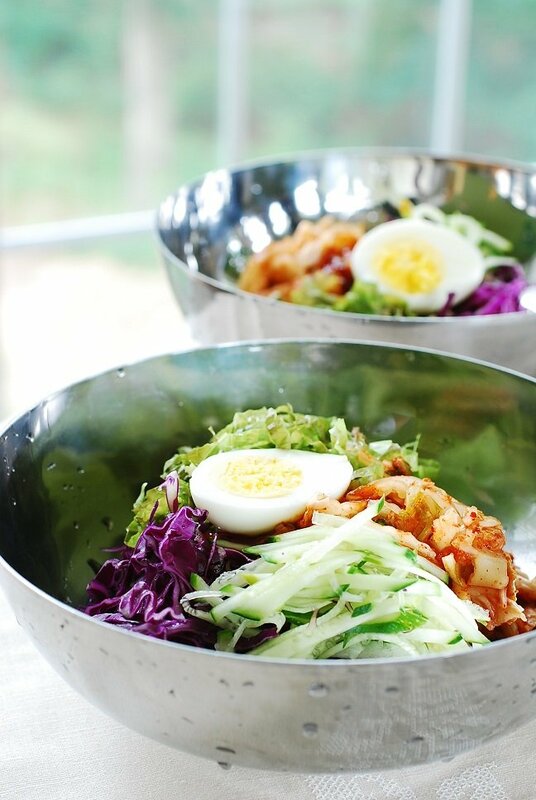 As with its rice counterpart, bibimbap, this is a very versatile dish. A simple version I recall from my childhood memories is made only with sliced kimchi and fresh cucumbers. On the other hand, the one I ate at the NY restaurant had plenty of surprises such as strips of squid, snails, shrimps and avocado. Here, I kept it simple. Using buckwheat noodles, I added a few vegetables to create a nice combination of colors, flavors and textures. Other vegetables commonly used are carrots, scallions, perilla leaves, and Korean radishes. Although not as common, red bell peppers, bean sprouts, watercress, and spring mix can all be excellent additions to this dish as well. So, be creative and have fun with it! The result is an especially appetizing dish that is perfect for hot summer days! A refreshing cold noodle dish in a sweet and sour gochujang sauce. Perfect for hot summer days! Bring a medium pot of water to a boil. Cook the noodles according to the package instructions (5 – 6 minutes). Drain quickly and shock in cold water to stop cooking. Drain and rinse in icy cold water until the noodles are very cold. Make two one-serving size mounds. Place the mounds in a colander to drain. Place the noodles in the middle of the serving bowl and nicely arrange the cold vegetables over the noodles. Drop a few ice cubes so the dish can stay cool while eating. The sauce can be served on top or separately. You can also add a small amount of lemon juice, orange juice, or soda such as coke or sprite for an additional layer of flavor. Buckwheat noodles is always my favorite. This looks lovely and refreshing. will be keeping this for summer. Excellent! Sigh… this looks so good. I keep telling myself I’m going to go to the Korean market to pick up some staples so I can make my own Korean food but I just never get around to it! 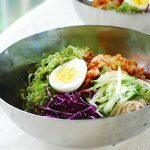 But with summer around the corner (hopefully… it’s grey and drizzly here in LA) some bibim guksu or mool neng myun will be in order! Another fabulous summer dish, Hyosun! I love soba noodles and this looks very refreshing. It’s finally starting to warm-up where I live and I’d love to try this. This is one of my favorite dishes to order out. Thank you for sharing the recipe! 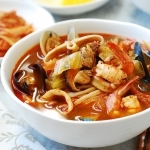 I made this recipe, your guksu sauce is amazing and the choice of vegetables is great. Very crispy and nice!! Next time, I’ll try to adding a little coca-cola or sprite. Fun!!! Thank you! Thank you, Bliss Bunny, for trying my recipe and leaving the nice comments. I really appreciate it. A little bit of coke or sprite will be good. I know some people do that. Hi Fern – Thanks for taking the time to let me know that. I am happy to hear you liked it. 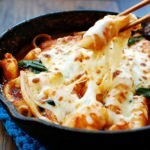 Hi Hyosun, thank you for sharing this recipe, looks absolutely wonderful! We went to the Korean Super Market today (takes about 45 minutes from our neighborhood), it’s always worth the journey, as soon as we walk in, the smell of Korean food hits and our mouth waters the whole time while shopping! I am eating it right now, after eating it in a restaurant many years ago – SO GOOD, thank you! Thanks for another delicious recipe. I was wondering if you have any suggestions on how to make a more toddler-friendly spicy sauce? Hi Grace – Omit chili pepper flakes, and reduce or omit chili pepper paste and hot mustard. 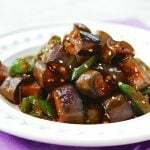 You may need to add a bit more soy sauce if not using the chili pepper paste. Also, you can add some ketchup instead to give a little color and flavor. Let me know how your child likes it if you try. 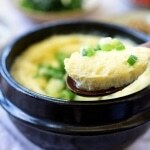 Yuuuuuumy Korean Foods…being an Indian we will love to try them out. I just discovered your site and I love it! 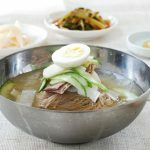 Can you tell me if this dish is also called bibim naengmyon? 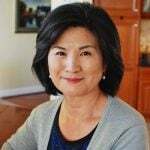 Hi Lisa – I am so happy that you found me! 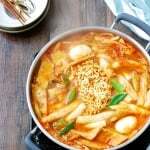 No this doesn’t use naengmyeon noodle, which is a different type of noodles.